According to the historian and bestseller author Yuval Noah Harari money is the most important human invention. Cryptocurrencies are newly invented money. Blockchain shall enable transfer of valuables and ensure online identities. The token economy is about building distributed trust. Will Switzerland be leading this money revolution? A small country like Switzerland is spearheading the re-invention of money. Even though many Swiss had not heard of bitcoin, blockchain or an initial coin offering (ICO) until very recently, Switzerland experienced an ICO boom in 2017. Switzerland also coined the term «Crypto Valley» that nowadays stretches from Zug to Zurich. The «Crypto Valley» is making news globally. The underlying blockchain technology is more than just digital money. In the Dezentrum think tank we encounter the first autonomous and smart contract ruled satellite. Procivis in contrast provides electronic identities for Rohingya refugees. And Alpine Mining in Wallis mine cryptocurrencies with cheap hydropower. Who are these coders, entrepreneurs, visionaries and investors who are engaged in this highly active community? Where does this enthusiasm for new ideas and business models stem from? Is this the end for banks or is it about the democratization of finance? Why are senior members of finance such as Rainer Marc Frei, Jorge Paulo Leeman and the Princely Family of Liechtenstein interested in this community? The crypto- and blockchain-communities are attracting global attention. The Swiss federal counsellor Johann Schneider-Ammann even coined the term «Crypto Nation Switzerland». Interested parties from all over the world visit Switzerland in order to learn about the newest technologies and businesses. Not far from Paradeplatz in Zurich the first blockchain hub opened this April. The blockchain technology is being applied to real estate all the way to the identification of refugees. Why is this all happening right here in Switzerland? Switzerland belongs the leading cryptocurrency and blockchain countries. In exclusive interviews we talk to the leading figures and show the breath of the technology. We will cover a whole range of topics from different perspectives. Your support will enable us to exclusively interview the leading thinkers in the bitcoin and blockchain communities in Switzerland. The results of these interviews will be published in a premium limited book in German. The book cover will be designed by the award-winning designer Christian Etter of the Museum of Digital Art in Zurich. The book will be formatted by an algorithm. This project ended successfully on 11/7/2018 09:00! Simple softcover book in German for yourself or for giving away. Including shipping. Personal and exclusive invitation for the book launch party in Zurich. Meet other supporters and the author. Share your views, thoughts and ideas about the Crypto Nation Switzerland. Be party of the community! A strictly limited premium hardcover book in German. Limited to 500 pieces. Designed by the award-winning designer Christian Etter of the Museum of Digital Art. The book will be formatted by an algorithm. Including shipping. The author invites you for a one-on-one coffee in Zurich for about an hour. Ask all the questions you every wanted to ask about the Crypto Nation Switzerland. Coffee is included! A strictly limited premium hardcover book in German. Limited to 500 pieces. In addition, entry ticket to the exclusive LAUNCH PARTY. The book is designed by the award-winning designer Christian Etter of the Museum of Digital Art. The book will be formatted by an algorithm. Including shipping. A strictly limited premium hardcover book in German. You will be LISTED AS SUPPORTER! Limited to 500 pieces. Designed by the award-winning designer Christian Etter of the Museum of Digital Art. The book will be formatted by an algorithm. Including shipping. The author personally invites you for a one-on-one lunch in Zurich. Ask all the questions you every wanted to ask about the Crypto Nation Switzerland. Lunch is included! The author will give a personal 30 minutes presentation in German or English about the people, startups and stories in the Crypto Valley. After the book you will be able to quiz the speaker (only in Switzerland). Alexander Brunner used to work for Ben&Jerry’s ice-cream before joining the finance industry. This is where he got in contact with bitcoin and blockchain. 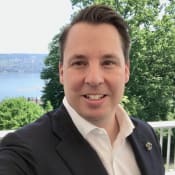 Alexander is also a member of parliament of the city of Zurich. The Museum of Digital Art operates at the nexus of algorithm, data and society. It shows national and international artist and hosts public events and workshops.